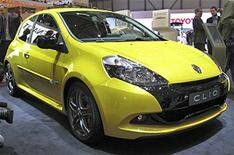 Renault Clio and Megane variants | What Car? Renault has five new or refreshed cars here at Geneva as well as replacements for the Scenic and Grand Scenic, making its stand the busiest at the show. The replacements are led by the 2009 Clio range, with a modified look that is based on the latest Megane for both hatchback and Sport Tourer, along with an optional exclusive Tom Tom sat-nav for less than 500 and three new or modified performance versions. The newcomer is the GT, which uses a mildly-detuned (128bhp) version of the 1.6-litre engine from the Twingo Renaultsport, or a 105bhp 1.5-litre diesel. Meanwhile there are revised Cliosport and Cliosport Cup models with 200bhp 2.0-litre engines. Their suspension systems have been modified softer for the standard model and firmer for the Cup to set them further apart than before. There are also four models that qualify for inclusion in Renault's environmentally-friendly eco2 range, powered by 75 or 100bhp petrol engines or 86 and 106bhp diesels. The entire range goes on sale in May. Changes to the Megane range will see a new Sport Tourer arrive in August and a 250bhp sports model go on sale in October. The latest Tourer follows the Laguna in concentrating on style rather than outright functionality, though with its longer wheelbase than the hatch it still provides more than 500 litres of boot space before you even think of folding the seats. The boot can be divided into two separate zones and almost 1600 litres of space is on hand when the car is running in two-seat configuration. Among the engine line-up is a new 130bhp 1.4 turbo and three diesels with CO2 emissions of less than 120g/km. The Renaultsport 250 will be available with standard and firmer (Cup) suspension settings. The Cup also has a limited-slip differential to enhance handling. The 250bhp output is 20bhp up on any previous hot Megane.